Deals aside, skiing and riding are a value for life. They are a lifestyle; physically challenging sports; family adventures; a common bond. They open the door to winter fun – bringing people of all ages together and satisfying the mildest of carvers to the heartiest of dare-devils. The common denominator is a universal feeling of joy – often revealed through a rosy-cheeked smile at about 4:00 p.m. slope-side. Don’t get Ski Vermont wrong, it’s nice to save a buck too, but it’s especially nice to be enamored – with life. Go in alone, or go with friends and family – all are welcome to enjoy the experiences of the mountain. Season Passes for Ascutney Mountain Resort are now on sale. This year the resort is pleased to announce a new addition to its Special Early Bird Season Pass Program. For the first time ever, skiers and riders can save up to an additional $150 off of each Premier Pass if purchased by Sept. 30. The Ascutney Premier Pass, valid every day of the 2008/2009 season, is one of the best values of unlimited season passes in New England. The price of a Premier Pass with the early bird savings discount, with no blackout dates, is $579 for juniors/seniors and $689 for adults if purchased by Sept. 30. Bolton Valley isn’t just one of Vermont’s favorite family resorts for day and night skiing and riding, its one of Vermont’s most affordable family resorts. A family of four can ski/ride Bolton Valley all season, with no restrictions, for as little as $1399. Individual season passes are priced as little as $499 for adults and $299 for youth and seniors. That’s outstanding value for a mountain with some of Vermont’s best glade skiing and riding, the highest main base elevation of any Vermont resort and three great terrain parks, including a Burton Progression Park. For Nordic enthusiasts, a season pass to enjoy 100K of classic and skate skiing is priced as low as $110 for adults and $70 for youth and seniors. The popular Bolton Valley Nordic Center Family of Four pass is available for as little as $289. Information on single day lift tickets at Bolton Valley and great lift/lodging packages and lessons are available at www.boltonvalley.com. Since its opening day in 1936, Bromley has been widely regarded as a resort committed to giving more value to its families. When asked why they chose Bromley, guests cited "that special, ‘Bromley Feeling,’" and "more value for your dollar" more than any other reasons. The fact is, Bromley shies away from multiple passes and special membership cards, in favor of basic, upfront value. Bromley offers a hefty $100 discount on season passes purchased by Oct. 15, and also offers two all-season, family centered specials designed to 1) get more folks on the slopes for less money – Family Fridays, when each paying adult pays just $12 each for up to three accompanying children and 2) fill their bellies while they’re here – Lift & Lunch Tuesdays, when an all-day lift ticket and a full, sit down, served lunch in the tavern costs just $39. Burke offers the Kingdom Pass, available to all students six to 24 years old attending schools in Caledonia, Orleans, or Essex Counties of Vt., or Coos County of Nh. Kindergarten to college, students can ski or ride Burke with the Kingdom Pass. The Kingdom Pass offers high school students a huge savings compared to the Youth Pass sold in recent years. This pass is also available to full-time students attending school outside of the Northeast Kingdom, but whose primary address is in Caledonia, Orleans, or Essex Counties of Vt., or Coos County of Nh. Burke also offers a Vermonter lift ticket to all residents of Vt. and Coos and Grafton Counties of Nh. Tickets are $41 for adults and 31 for students and seniors. The Vermonter ticket will be offered Sunday through Friday during non-holiday periods. Cochran’s Ski Area is a perfect place for young families to learn to ski or ride. Cozy and affordable, the Cochran family – including Olympic gold medalist Barbara Ann Cochran – have been teaching locals and visitors alike to ski for over 45 years. 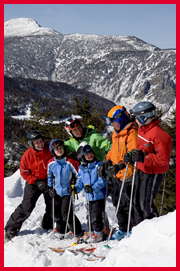 A family pass - good for a family of any size all season long – costs just $330 before Dec. 1st. For those that plan to ski/ride three to eight days this season at Killington and Pico, the Killington Express Card is a great option and provides direct to lift access and savings of at least $10 off daily ticket rates. The Killington/Pico Express Card provides "pay-as-you-ski" flexibility. The card works like a season pass (with the skier/riders picture on it) and is linked to a credit card. The first time each day the Express Card is scanned at the lift, the credit card is automatically charged the discounted rate. The Killington Countdown Card offers savings of 10 to 15 percent off the regular season one-day rate when purchased in six or 10–day increments. The Countdown Card is valid everyday of the season and the dollar-value of any unused days at the end of the season may be applied to the purchase of next year’s Countdown Card. The Countdown Card is perfect for skiers/riders who visit during regular season and holidays six or more days, but not enough to warrant a season pass, and value the lowest available price available on a one-day lift ticket. Mad River Glen prides itself on being one of the best ski values in New England. The best and easiest way to ski cheap at Mad River is to come midweek when ticket are only $39 a day, every day - no coupon, no specials, no hoops to jump through. There are great preseason deals to be had such as the Free Kids Pass Program for kids under age 12, the Mad Card and a variety of season pass options to suit every skier. Once the season begins, look out for specials discount days like; Roll Back the Clock Day when skiers pay the original 1948 lift price of $3.50, St. Patrick’s Day when skiers who wear green pay $17 and Town Meeting Day when all school kids ski free! Visit MadRiverGlen.com to see all the details. Magic Mountain is home to some of the best deals in New England. Not only does Magic Mountain offer some of the lowest regular rates, accessing some of the best terrain in New England, it also offers the discount savvy skier or rider a multitude of options for more discounts. Car Pool Wednesdays: On non-holiday Wednesdays throughout the season guests to Magic Mountain can car pool (at least 4 people per car) with their friends and family and the entire car load gets lift tickets for only $80. Ski and Ride with Friends and Family: Skiers and riders who come to the slopes of Magic Mountain with at least 3 of their friends or family midweek can take advantage of $25 lift tickets all season long. Simply load the car up with at least 3 people midweek, non-holiday, all season and everyone in the party receives $25 lift tickets per person. Magic Mountain Season Pass: Ski or ride all season long with no restrictions for only $419 before Sept. 30 and $459 after Sept. 30. The Nor’Easter pass gives exclusive access to Mount Snow and other great Peak Resorts ski areas with no blackout dates, and it gets 20% off at all retail outlets and access to First Tracks early lift access. The Classic Pass delivers access to all of Mount Snow’s 107 trails, with the same discounts and First Tracks privileges, at a discounted rate. The Higher Education pass is offered to all full-time college students at a deeply discounted rate, and it’s valid at all Nor’easter resorts. For those lucky enough to get to the slopes on weekdays, the Midweek pass is the way to go. As always, kids five and under ski free! Don’t forget about Mount Snow’s $99 FANfare card, that’s 50% off midweek non-holiday lift tickets, 25% off weekend non-holiday tickets and 10% off holiday tickets, all season long. There are lots of ways to save on skiing and riding at Okemo Mountain Resort. From daily offerings, to special events, to season-long savings, Okemo has a great deal designed to fit every ski trip budget. Frequent skiers and snowboarders will love the variety of savings options. When skiers and snowboarders purchase an Okemo Flex Card for $99, they save 50 percent on weekday, non-holiday (Mon.- Fri.), single-day lift ticket rates and 25 percent on weekend and holiday single-day lift ticket rates, plus 50 percent on single-day lift ticket rates every day in Nov., and from March 16 through closing day in April. The Okemo 8-Pack and 12-Pack provide multi-ticket savings with no restrictions and are interchangeable, so family and friends can ski for less too. When it comes to season passes, Okemo’s Ultra Pass covers it all – including ski trips to other great resorts. Skiers and snowboarders can enjoy the slopes every day at Okemo and three other partnering resorts with no restrictions for only $1,369 for adults ($1,469 after Oct. 13). It’s like getting four season passes for the price of one – with added discounts and benefits at Okemo. Value-packed coupon specials and otherwise-unadvertised deals are just a click away at Okemo.com all season long. Website banner specials are available only for a limited time or may rotate throughout the season. Very sweet deals await destination guests as well as locals at Smuggs this season. For those who live close by, Smuggs’ line up of Season, Family or Hybrid passes and the Bash Badge is destined to meet the needs of individuals, students, or families and their free time schedules. These products are priced very affordably and carry terrific bargains in the form of 20 – 50 percent discounts for equipment rentals, lessons, cross-country trail fees, nursery services, children’s ski and snowboard camps and other benefits. The Club Smugglers’ Advantage Package is Smugglers’ best family vacation deal with perks galore - daily ski/snowboard camp for three to five year olds, daily 1.5 hour ski/snowboard group lessons for those age 6-17, daily 1.5 hour adult group lessons for levels one and two, the winter walking program, use of cross-country and snowshoe trails, plus discounts on adult group lessons for those beyond the beginner stage. This is all in addition to the resort’s roomy mountainside condo lodging, the daily lift tickets for everyone and multiple off-slope activities for kids, adults and both together. Visit Smuggs.com . At Stowe Mountain Resort, buying lift-tickets seven days in advance saves money and adds value, even during peak holiday periods. The Vacation Rewards Program combines lift tickets with a menu of other on-mountain benefits, and many Stowe area lodges are combining it with a place to stay. Here’s how it works: Purchase multi-day lift tickets at least seven days in advance and receive 15% savings off multi-day ticket rates, holidays included. Tickets can be purchased online at Stowe.com or by calling Stowe’s toll-free 1.888.253.4TIX. The Extras: With a two or three consecutive day adult/senior ticket purchase, choose a two-hour ski/snowboard demo from the Stowe Toys Demo Center or one free Quick-Tune. Trapp Family Lodge offers great prices on cross-country skiing season passes with adult passes costing approximately $200, Seniors $100, Juniors (age 12-18) $100, and children only $30. Additionally, family packages (two adults and three children under 18) can be purchased for around $250 for the entire season. The property’s Nordic Ski Center also offers equipment rentals with great multi-day specials. Celebrating the 40th anniversary, there will be many special events and ski packages throughout the season. Sunday Pass- Make Sunday a ski day for just $229. Divide that by the 17 skiable Sundays during the season and that’s $13 a day! Value Pass- Valid all season (non-holiday) for $579, with only 19 blackout dates), direct to lift convenience, resort charging and more benefits. Standard Pass- Ski or ride every day for only $979. No blackouts plus, offers at other Intrawest resorts, special rates on rentals and more. Pay as you go with the X2 Card: Purchase an X2 card and get one free day (non-holiday) plus save every day of the season. This picture pass offers direct-to-lift convenience Resort charging, $30 off midweek non-holiday, $20 off weekends non-holiday, $10 off holidays. Early Booking Offer: Book a Stratton vacation before Oct. 13 and receive the best price of the year with 20 percent off weekends, 30 percent off midweek plus a relaxed cancellation policy and price protection. This has been called one of the "the best early booking offers anywhere." Traveling with Kids Tip: Feeling nervous about traveling with the kids? Consider travel insurance, this can help put your mind at ease in case the unexpected happens.